I love coffee. I really love coffee in my beer. And these days it seems like I have more choices than ever for coffee beers. Not long ago most coffee beers were stouts or porters. 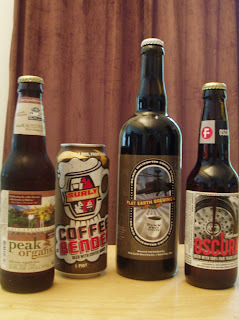 These were big, thick beers suited for cold weather drinking and they were delicious. Now, though brewers seem to be branching out, experimenting by pairing coffee with other styles of beers, many of which are well suited for warmer weather. One of the locals, Furthermore’s Oscura, has just come back on the shelves and it prompted me to do a mini head to head taste testing of some of the readily available bottled or canned coffee beers. Mag and I sat down tonight with Oscura, Surly’s Coffee Bender, Flat Earth’s Black Helicopter and out of Portland, Maine, Peak Organic Espresso Amber. On any given day I’d be happy to drink any of these but having not had any of them in the same sitting, it was time to taste test them against one another to really tease out what characteristics of each spoke to me. Both Coffee Bender (5.1% ABV) and Black Helicopter (5.2% ABV) were light on the tongue, finishing clean, with Black Helicopter having a bit more bitterness and smelling the most like a beer. Espresso Amber (6.8% ABV) and Oscura (5.3% ABV) were surprisingly similar in light amber color with Espresso Amber having the strongest coffee aroma, like a cold espresso. They were more full bodied than Bender and Heli with Oscura taking the cake with its silky smooth mouthfeel, the result of the flaked maize. From oatmeal brown to stout to amber to Mexican brown, these are all wonderfully made, easy drinking coffee beers. Tonight, however the Sconie beat out its Minnesota and East Coast competition. I particularly like the fruit notes in Oscura. They add a depth to the beer that I do not find in other coffee beers. I am going to have to pick me up some of that Oscura. I've never had it and I love coffee beers. I was really impressed with the Peak Espresso when I had it last fall. Great post! I liked the reviews and photos. Like what's here? Follow us elsewhere!